VF Corporation brands are known for their quality and popularity. They bring the right products to market by understanding what their shoppers are looking for. Their success is achieved through a deep understanding of their consumers and, with an eye to the future; they continually work to strengthen the bond between their customers and their brands. To maintain this leadership position, VF brand, The North Face, wanted to provide an intelligent, intuitive search experience for their eCommerce customers. They wanted to drive more revenue through their eCommerce site and maximize revenue per search. To accomplish this they wanted to implement a solution that would understand both the intent of the consumer’s search as well as a deep understanding of the content, making it easier to find products with fewer clicks, on IBM WebSphere (U.S.) and Magento (Europe) eCommerce platforms. “At The North Face, we are constantly innovating to provide the best products to our customers, to deliver the best advice instore & deliver a similarly quality user experience online,” Chris Todd, Director of eCommerce The North Face EMEA said. “Our sales per search session increased by 23% when we added EasyAsk to our WebSphere platform,” said Cal Bouchard, Sr. Director of eCommerce at The North Face. 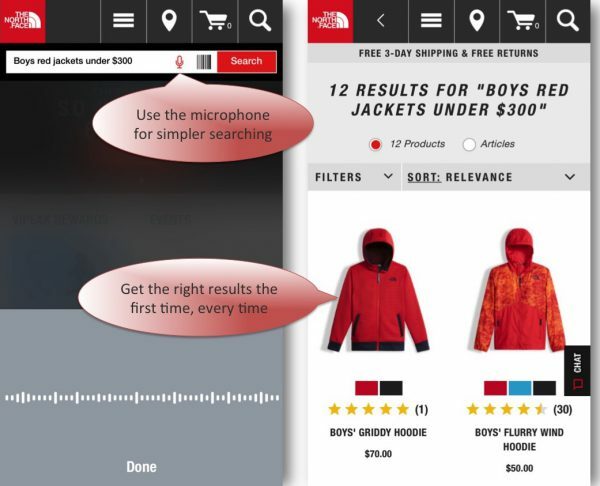 In their effort to drive more revenue per search, The North Face U.S. chose to replace their eCommerce platform’s default search engine, SOLR, with EasyAsk. EasyAsk provides smarter search and merchandising, through its patented Natural Language software for eCommerce. EasyAsk offers smarter solutions that extend beyond other Site Search technologies that only offer keyword-based search and merchandising. “EasyAsk allows our customers to find the right products quickly and efficiently. The resultant uplift in conversion rates and revenue from search has been extremely positive,” Todd said. The North Face’s annual revenues exceed $2bn with a significant percentage in eCommerce. “It’s definitely safe to say that our sales per search session increased by 23% when we added EasyAsk to our WebSphere platform,” said Cal Bouchard, Sr. Director of eCommerce at The North Face. These numbers speak for themselves. The comparison was made against the default search engine that is included in WebSphere Commerce, SOLR. SOLR is an open source tool that requires many more man-hours and programmer level management compared to EasyAsk, which can easily be used and configured by business users. This reduces the time and resources required to optimize the search & navigation functions of The North Face’s various sites, increasing productivity and speeding up the process to make changes to the site. EasyAsk’s pioneering use of Natural Language technology means not only are consumers better able to find the right product but a brands own business user can utilize the same simple Natural Language capability to manage the site search function and make changes as required to drive business improvement. The increase in sales per search was accomplished by EasyAsk’s ability to understand the intent of the search request, not just the keywords. Delivering the right results for search and a consistent user experience across all channels is so important in today’s world, where more and more people are searching on the go. Consumers are taking advantage of the talk-to-text technology built into every smartphone by asking their phones to find the merchandise they want. With EasyAsk Natural Language search they get a perfect result from every search. For example, simply speaking, “ladies red ski jackets”, “women’s ski jackets in red” or even, “Can you show me all women’s red ski jackets under $300?”– will serve up nothing but women’s ski jackets in red for under $300. Unlike SOLR, EasyAsk gives The North Face complete control over their site with advanced merchandising tools that are easy to use and provide features that allow the merchandiser to display the products they want. They also have the ability to enhance the customer experience by displaying cross-sell and up-sell merchandise. When The North Face started with EasyAsk, “color” was an important attribute of most products. They quickly discovered that EasyAsk could not only deliver the results, including color as a primary criteria, but also help them stack the results in the order they chose: Men’s, then Women’s, then Children’s. By using a simple Business Rule to control the order of display, The North Face easily set up their website to show the products in the desired order. The ability to intuitively control Business Rules with little maintenance is another strength of EasyAsk versus the complexity of using SOLR’s tools. The North Face has the ability to easily change any of their rules as needed on an ad hoc basis, such as by holiday season (insulated clothing first) or the summer months (hiking/mountaineering gear first). Following the success of the EasyAsk rollout in the U.S. and Canada, The North Face EMEA group deployed EasyAsk to support their business units across nine countries including the United Kingdom, Germany, Netherlands, Sweden, France, Italy, Spain and Austria. The North Face in Europe has also made excellent use of another of EasyAsk’s unique capabilities, in this case the ability to create new ‘Virtual Categories’ offering their consumers new ways to shop their site. For example, a business user can create a new shopping option called ‘Activity’ which allows a ‘Mountaineering’, ‘Hiking’ or ‘Skiing’ enthusiast to view products that are most relevant to their favorite outdoor activity. To create these ‘Virtual Categories’ the business team at The North Face was simply able to use natural language business rules to group relevant products, thereby offering their customers a more personalized way to shop, without the involvement of technical resources or the need to manipulate any of the back-end systems. By presenting customers with new innovative shopping options, The North Face is better able to engage their customers with a more relevant, personalized user experience. By putting the right tools in the hands of the business users, The North Face’s merchandisers are able to focus on creating a more effective shopping experience and are not limited by the complexity of their back-end systems or availability of specialized technical resources. Studies have shown that up to 85% of site searches do not return what the user sought, and as many as 80% of visitors will abandon a site if the search results are poor. The North Face saw a dramatic drop in bounce rate on their European sites of 50%, meaning their customers were better able to find what they were looking for, whether using the advanced site search & navigation functionality or by more relevant ‘Virtual Categories’ designed to engage those with a particular specialist interest. The EasyAsk application has delivered a quantum leap in capability for The North Face, driving significantly more revenue, higher average revenue per search, greater control and merchandising functionality; which maximizes the value of their existing eCommerce infrastructure (IBM Websphere & Magento), and delivers a far more effective user experience. EasyAsk’s powerful solution can help your business replicate such results, regardless of the eCommerce platform you use today and can be implemented in just a few weeks. EasyAsk can upgrade or improve your existing site search capability to its smarter, intuitive and extremely profitable search engine. Isn’t it time to stop being hampered by the man-hours needed to work with SOLR? Isn’t it time to stop accepting “okay search” as “good enough”? We think so, The North Face thinks so, and the numbers prove it. About EasyAsk Technologies, Inc. EasyAsk is the leading independent provider of intelligent Natural Language search and merchandising functionality. We integrate with and enhance your existing eCommerce site by providing an intuitive User Experience that lets shoppers simply ask for what they need in their own words and get the results they want. As an eRetailer you instantly provide your customers with the products they need, on the first page and give them an outstanding experience that they will remember. Let us show you how much can be done when you put the power of EasyAsk at the fingertips of your customers and your merchandisers. Contact us at 800-425-8200 or [email protected].